Congratulations to the Cohort 5! The graduation of FIPDes Cohort 5 took place on the 8th of September in Paris! The 23 students of FIPDes Cohort 5 received their diploma at the United States Fondation in the Cité Universitaire in Paris. On this occasion, most of the students were wearing their traditional costume. Families from Costa Rica, Ireland, Taiwan, the Philippines, Colombia, Ghana, Guatemala, Malaysia and China came to attend the ceremony! 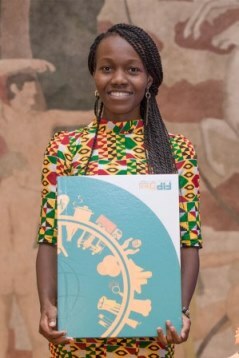 I am Elizabeth Ama Mensah from Ghana. My specialization was in Healthy Food Design from the University of Naples, Italy. Naples was a very welcoming city and I loved the fact that most of the lecturers were involved in on-going research in their respective fields so they introduced us to up-to-date knowledge and technology in most fields related to the design of healthy foods. For my master thesis, I worked with Professor Mauriello, an expert in the field of active packaging in Agraria, UNINA. I investigated the potential to increase the shelf life of some food products using an emerging preservation technology called antimicrobial packaging. It was an opportunity for me to improve my analytical, problem solving and research skills and broaden my knowledge in food preservation. FIPDes will remain one of the most unforgettable memories in my life. In the space of 2 years I have been exposed to so many things and I have seen positive growth in both my personal and professional life. I am more open-minded and adaptable and my chances of employability have been improved because of my experiences in FIPDes. I would like to go back to Ghana and start a career in the field of research and product development. In 5 years, I hope to be part of agroprocessing projects aimed at reducing postharvest losses in Ghana while improving the nutrition status of the populace. Hello, I am Natalija and I come from Macedonia. After an amazing first year filled with different experiences in Paris and Dublin, I decided to take the specialization in Food Design and Engineering and come back to Paris for the second year. This specialization consists of many challenging topics to cover, such as Physical Chemistry and Chemical reactivity, but I would like to point out one, which is the Senior project. This subject was prepared by team work and gave me the possibility to learn a lot related to scaling up a recipe and process from kitchen scale to industrial scale. I became aware of the many obstacles to overcome during this transformation but also had made me learn that any of those obstacles can be conquered when you work in a team with people willing to help and learn from each other. I did my internship in a mixed research unit called “Calipro” where I worked with researches from AgroParisTech and INRA whose work is dedicated to control the transformation and the reactivity of chemical species when food undergoes different transformation processes. The subject I have been working on consisted on evaluating the effect of pH on the stability of vitamin C, aiming to create a predictive kinetics degradation model. Besides the kinetics part, this subject involved validation of a new analytical technique of detection of vitamin C. The work was quite challenging and interesting for me and helped me develop new skills which I can apply further on in my career. For me FIPDes was a life changing experience. The opportunities and challenges that I have faced during these two years made me grow professionally as well as personally. I have developed different skills and have explored new areas of the food sector. I have created a network with people sharing common interest and important people from the food industry that would help me discover my potential for my future career. Besides, I believe I graduated from this program as a stronger individual ready to tackle different life challenges, being able to adapt easily to changes of environment and cultures but also be able and happy to live, share and care for people from different countries. With these people I have made memories that will last forever. They became my friends for life, they became my FIPDes family. Now that I have graduated, I have decided to spend one more year in Paris and dedicate my time to improve my French language skills and look for a job opportunity within the food industry. I would like to work preferably in the R&D department of a company that shares the same values as me, to provide health through food to consumers from all over the world. Developing healthier alternatives of food products would be the perfect job match for me, however I do not exclude the opportunity to continue with studies later on in my career with another master or PhD. My name is Yoga Putranda and I am from Indonesia. 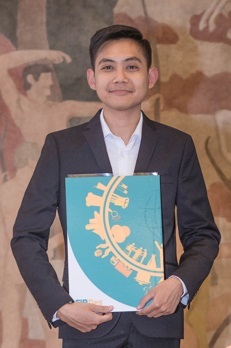 In my second year, I chose Food Packaging Design and Logistics specialization at Lund University, Sweden. I have a very good impression of Lund and Lund University. Lund is a small student city that provides a great student life. The lecturers in the university are very good in teaching and very approachable. There were many lectures and projects from industry which made it a real-case learning. In term of the administration, assignment, and examination, the system at Lund University is very well-structured. I did my master thesis in collaboration with Lantmännen, a Swedish company. My thesis was about evaluating commercial biobased packaging materials for bread packaging application. It was an exciting thesis work since it includes literature study, supplier search, factory visit, and the experiment in the lab. I describe FIPDes as a journey to remember. FIPDes has changed me in term of knowledge learning and individual quality. I learned about the knowledge and technical skills that support innovation in food product development. Besides that, FIPDes taught me to be adaptable and to be more open-minded. One of the best things that happened to me during FIPDes is meeting 22 other classmates from all over the world. They are my friends, family, and teachers in different aspects. After finishing FIPDes, I am starting my professional career in Europe. I am now working as Product Development Technologist at The Kraft Heinz Company in Nijmegen, Netherlands.